Within a stone’s throw of the Montegrappa works – home of the oldest pen manufacture in Italy – is the heart of another industry. Grappa is the local tipple, and it has never been more popular, finding new friends in bars and saloons from Mumbai to Manhattan to Macau. 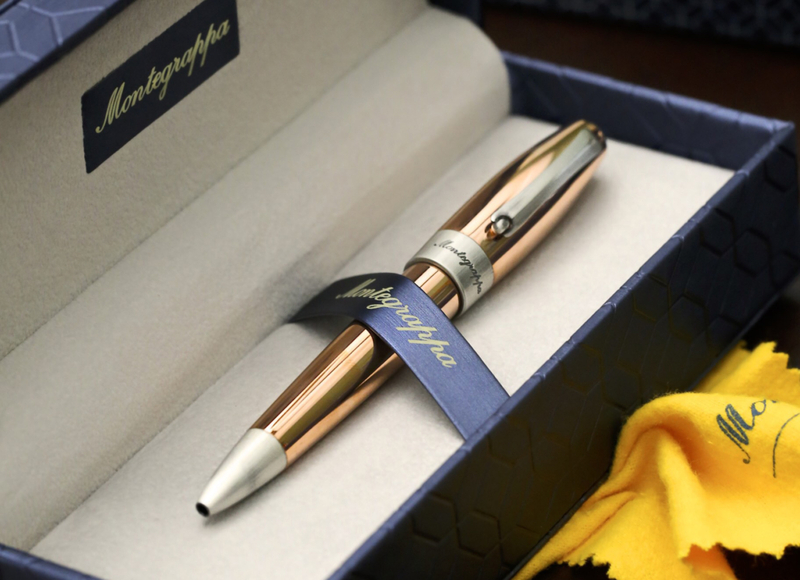 Following the success of the spectacular limited edition Grappa pen in hammered copper, Montegrappa again honours the locals’ favourite beverage with a pen inspired by both the drink and the equipment that distills it. Featuring a shape that is classic Montegrappa, curvaceous yet sleekly contemporary, the Montegrappa Mule pen collection further displays its familial links with a cap top bearing the famous “1912” logo, while the nib is embellished with a filigree Montegrappa pattern. The cap and barrel are crafted in mirror-polished copper, further defined by a brushed silver-plated trim. The effect recalls the well-used, vintage piping and tubing employed in the process of producing grappa. Over the time, each Montegrappa Mule will acquire its own unique patina through handling by its fond owner, truly personalizing the writing instrument. Easily recyclable without any loss of property, copper is a naturally hygienic metal that slows down the growth of germs. It is widely used in food preparation and health equipment, as well as in design and various artistic forms. Available in three versions, the Montegrappa Mule will suit the user of fountain, roller or ballpoint pens. Further individualising the Mule is the choice of writing grades to suit the owners of the fountain pen, with nibs in Fine, Medium and Broad, and carry its ink supply with either a cartridge or converter. Merely honouring the grappa tradition would be enough to explain the design of the Montegrappa Mule, but Montegrappa’s creativity has been imbued with the spirit of the … spirit! Initially inspired by the classic Moscow Mule cocktail, traditionally served in a copper mug, Montegrappa has registered an exciting new grappa-based cocktail. Created by famous Bassano-based mixologists, brothers Edoardo and Leone Miotti, the recipe is specially developed and already featured on the cocktail menu of Bar Danieli. The Montegrappa Mule will be sipped with relish during the promotion of the pen at various sipping’n’sampling bar and in-store events. The drink itself is made of 40° premium-quality grappa, bergamot scents and a habanero-chilli pepper twist. Securing the link between pen and drink will be a copper mug given to each purchaser of a Montegrappa Mule pen, the mug personalised with a special Montegrappa Mule logo. And to fill the mug? Each pen purchase will also include the special recipe. Grappa, regrettably, will not be included!